He also wrote the first Web page editor/browser (“WorldWideWeb”) and the first Web server (“?httpd“). By the end of 1990, the first Web page was served. By 1991, people outside of CERN joined the new Web community, and in April 1993, CERN announced that the World Wide Web technology would be available for anyone to use on a royalty-free basis. Since that time, the Web has changed the world, arguably becoming the most powerful communication medium the world has ever known. Whereas only roughly one-third of the people on the planet are currently using the Web (and the Web Foundation aims to accelerate this growth substantially), the Web has fundamentally altered the way we teach and learn, buy and sell, inform and are informed, agree and disagree, share and collaborate, meet and love, and tackle problems ranging from putting food on our tables to curing cancer. 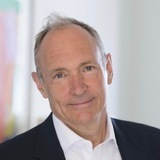 In 2007, Sir Tim recognized that the Web’s potential to empower people to bring about positive change remained unrealized by billions around the world. Announcing the formation of the World Wide Web Foundation, he once again confirmed his commitment to ensuring an open, free Web accessible and meaningful to all where people can share knowledge, access services, conduct commerce, participate in good governance and communicate in creative ways. A graduate of Oxford University, Sir Tim teaches at Massachusetts Institute of Technology as a 3Com Founders Professor of Engineering and in a joint appointment in the Department of Electrical Engineering and Computer Science at CSAIL. He is a professor in the Electronics and Computer Science Department at the University of Southampton, UK, Director of the World Wide Web Consortium (W3C), and author of Weaving the Web and many other publications.